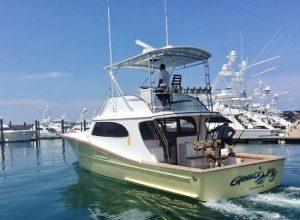 This brand new 43-foot Cold-molded Flybridge Sportfishing Yacht powered by twin Cats and built by Maverick in 2015, fishes out of Los Suenos Marina in Playa Herradura. It cruises at 27 knots and has a 900+ gallon fuel capacity for overnight trips. Captain David Mesen is at the helm, assisted by two bilingual mates. It has 25kw x band radar; 5,000ft echo sounder; GPS navigator on Nav-net screens; LED accent lighting; Simrad autopilot; two VHF radios and JBL stereo; Penn reels, heavy and light tackle, stand-up and fly rods, tuna tubes, live bait wells, a large cockpit, Release Marina fighting chair, and fully air conditioned salon; two oversized bunk beds, and marine head. She is also available for overnight trips.